Design by Christian Ploderer, 1998-2000. 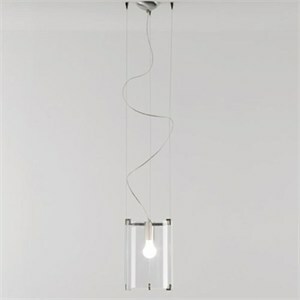 Suspended lamp for diffused or direct lighting. Chrome or brushed nickel structure and canopy. Satin opal white, bright grey or clear crystal blown glass diffuser. Fixture is suspended from three support cables with a "floating" canopy, this provides a little bit of flexibilty when the junction box is not centered. Dimensions 9.5"D X 13"H, 78.75" maximum overall height. Uses 1 X 150W 120V E26 (medium base) A21 incandscent lamp (not included).